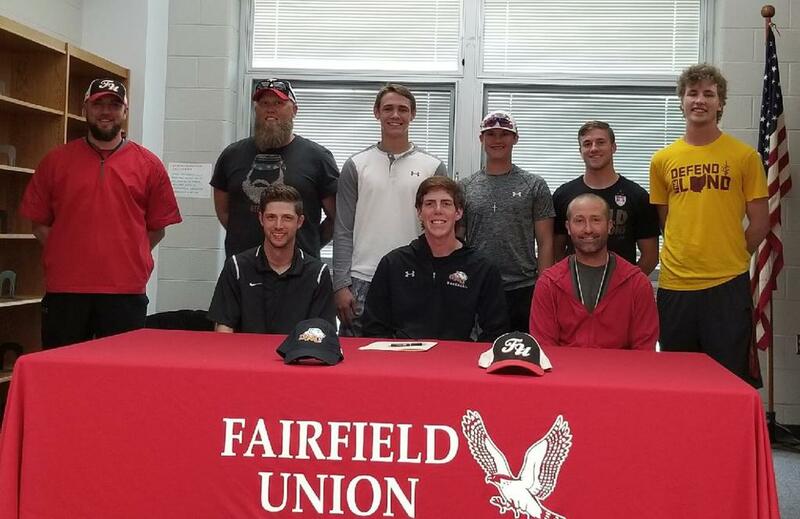 Congratulations to Jon Hillberry (FUHS, 2018) for selecting Ohio Northern University to continue his academic pursuits and to play college baseball! Going to college and playing baseball is a big deal for anyone, and Post 11 is very proud of and happy for Jon. He has certainly worked hard and deserves it! Jon joined Post 11 for the 2018 season. His primary role was pitcher-only. But, he gave the team much more than a pitcher's-only contribution. He was a great team mate; set a standard for hard work; and was a natural leader. During the season, Jon pitched in 10 games for a total of 54 innings. He landed a record of 7-0, threw 4 complete games and had an ERA of a mere 1.69. One of his complete games came in the state tournament against the formidable Jefferson Co Post 33 (Steubenville) where he gave up only 5 hits and held Post 33 scoreless. It was a great win for the team and for Jon. After the game Jon said, "That may have been the biggest game I've ever pitched." Reasons being, it was the state tournament, Steubenville is always tough, and his future college coach, Ohio Northern University's Coach Gene Stechschulte was there watching. When Jon wasn't on the bump, he was his teammates' biggest fan. He continually encouraged, cheered and kept the dugout loose. Between starts, Jon followed Post 11's arm-care regime to a 't'. He was diligent, worked hard, and didn't miss a beat in getting ready for his next start. He set an example with his work ethic and celebrated his teammates successes vigorously. Post 11 was fortunate to have Jon in the program. Below is an interview with Jon on his decision to go to college and to play college baseball. It's a great read. You'll quickly see Jon's emphasis on relationships, team, hard work, and respect for his coaches and teammates - qualities he exhibited while playing for Post 11. There is also a link to Ohio Norther University. Check it out to learn more about Polar Bear Baseball. Which college have you committed to? I decided in early March to further my academic and baseball career at Ohio Northern University. How does it feel to know that you'll be playing college baseball and why? It feels incredible knowing that I will not only get 4 more years to continue the sport that I love, but also to continue my dream. Ever since I was a kid, I’ve wanted to play college ball and knowing that I’m doing it is incredible. What is your favorite thing about the college you chose and why? So far, my favorite part about college has to be the new relationships. Meeting the other new freshman and creating a bond to carry over the next few years is a great feeling. Also, meeting the upper-classmen has been a great experience too, it is a surreal feeling picking their brains and trying to learn as much as you can from their time here. It really helps you to better yourself. How do you see yourself contributing to your new college baseball team? As for bettering myself and the team in the upcoming season, I am going to work as hard as I can in the off-season and see where everything falls come spring. I feel that the best thing that I can do for my team and myself is listen to the coaches and fellow teammates because my view of baseball is, the best form of baseball is unselfish baseball. But, I feel that a good goal for me as a freshman would be a closer or middle reliever, then work my way up the chain as I continue. What do you know about your new coach? And, how will you go about getting to know him and his staff and what they expect of a new team member? Coach Stechschulte is a great coach with a ton of experience. I’ve already learned a lot since I’ve been here. I look forward to getting to know Coach Stechschulte and his staff as I’m here. What do think will be the most challenging about college baseball? The most challenging thing about college baseball will be the schedule. I knew that it would be different than high school ball but since fall ball has started it has confirmed it. Being a student athlete in college is like having a full-time job. But having played legion ball, I feel that I am up for the task. What is the biggest thing you'll carry forward from American Legion Baseball to your college career? The biggest thing that I have carried over from the American Legion Baseball is mentality. American legion is packed with talent, so you have no time to get frustrated when something doesn’t go your way. This will play a major role in my college career. Another trait is the people you meet. I have met some of my best friends playing in this organization and also, I’ve had the best coaching that I have experienced. The coaches' first priority is making you into a man and a good person and that is something that not many organizations can offer. What advice would you give other ball players going through the recruiting process and considering a college baseball career? My advice to kids trying to get recruited or that are getting recruited is always keep going. The process is long and sometimes frustrating, but the payoff is amazing. Always work your hardest even when you think that no one is looking because odds are, if you can play and you have the passion, eyes will always be on you, and word travels fast. Do you know your major yet? My major at ONU is Construction Management. What do you think will be the first thing you do when you get to campus? The first thing that I did when I got to the campus was meet the other freshman. Together we explored the campus and figured out the main hangouts. Prediction - how many 'all nighters' do you think you'll pull in your freshman year studying for exams? After being here a couple weeks, I predict that there will be a couple nights where I won’t be getting much sleep as I’m up studying. But I know that I won’t be alone, something that I’ve learned is when you’re on a team, you make each other better on and off the field, and I think that, that’s the best part about playing college ball.